re-jetting any dirt bike or any carbureted engine for that matter is critical to getting it to perform and it can be a very simple process if you know what you are looking for. All carburetors work on basically the same principles and once those are understood you can begin to understand the process of re-jetting. The purpose of the carburetor is to provide a satisfactory fuel/air mixture to the engine throughout a variety of changing conditions. This is done through a jet, or a precise opening that allows only a certain amount of fuel to pass through it. Most often a number of different jets, needles, passages etc. are used to accomplish this task. Jetting Basics is an article I put together when jetting my 2001 CR250 2-stroke and will explain this in more detail and describe the process of re-jetting a bigger / 2-stroke bike. The bike we are working with here is a 2004 Suzuki DR-Z 110 with an aftermarket Leo Vince Exhaust. With the exception of the exhaust, everything is stock. The DR-Z is a KLX 110 with suzuki plastics on it, so everything here would apply to the KLX 110 as well. When re-jetting this bike there are basically 3 different things you can look at as outlined in red in the diagram. They are, the main jet, the pilot or slow jet, and the jet needle. If you are working with a stock or close to stock bike, these 3 items should be more than enough to get the bike to run very well at a variety of different elevations assuming everything else is set and working properly. The stock jet needle on these bikes are NOT adjustable so they will only have one groove for the clip to go into as opposed to the various groove options shown on this aftermarket jet needle on the left. For a stock bike, the stock needle should be sufficient, but an adjustable needle will give more tuneability and could produce more power where you need it, especially if a bigger bore etc. is being used. With 3 different adjustments to make, taking one out of the equation is not a bad thing, so unless you really feel the need just work with the stock needle. The purpose of the needle is to block or partially block the main until you roll on the throttle lifting the needle and allow the main to come on. Adjusting the needle can change the "hit" that a bike has as can the other components to some degree. Our bike was running fairly well at 4,000 feet in elevation with the stock setup (80 main, 38 pilot) When we took it up to 9,000 feet however, it started to exhibit more sputtering that before was only barely noticeable. The main thing that stood out was the sputtering from idle. The bike would sputter, but at full rev would clear up and run OK. It was also hard to keep the idle consistent. We only needed to come out about an eighth turn on the air screw and often the idle would not return to normal level immediately upon releasing the throttle. We had to set the idle high, then it would idle high and then very low and sometimes die. Jetting the main is usually done by plug chop, ride the bike at full revs loaded in say 4th gear,hit and hold the kill switch in till the bike rolls to a stop. Look for a milk coffee colour on the porcelain, use a used plug that has already colored up, Grey or white plugs are too lean, black coffee is too rich. Ours was definitely black and far too rich. To remedy the problem we simply went down from the stock 80 to a 78 on the main. This made the bike run perfectly at the 4,000 feet we normally ride the bike at. We've kept a 75 in the pack in case we need to reduce it again at the higher elevations. We found these jets for a few bucks at rocky mountain atv. 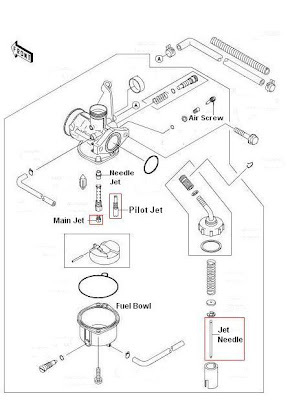 To change the main jet, the fuel bowl will need to be removed. I decided that it was easiest to remove the entire carburetor to do this, but I'm not sure if it was necessary. The main just unscrews with a flat head screwdriver, then the new one can be screwed back in. I also cleaned the carburetor and all the ports to make sure everything was good. We did not need to mess with the pilot jet at all, however just by changing the main, we were able to go out a little more on the air screw and the idle would return to normal very consistently, and the sputtering was gone. Sometimes problems that seem like idle, or the pilot jet are really to do with the main after it comes off the main and onto the idle. It also screws with your plug after a while making it run even worse after a while. Before doing a main jet change, however, it's important to make sure all the other stuff on the carburetor is adjusted correctly and in good working order including the floats, float level, fuel shut off needle, air screw etc. Start with the stock settings in good working order and fine tune from there. Look at your plug and be aware of what conditions make your bike run better or worse to know which way you need to go on the jetting. Use common sense too. If your bike is still running with stock jetting and your at 4,000 feet, chances are you'll need to at least go down a bit on the main. If it's not running perfect and the plug looks black it's confirmation that your not getting the best performance. Don't be afraid to experiment a bit, but keep an eye on your plug and make sure it doesn't get too hot(white). These bikes seem very forgiving, so a little rich is better than a little lean. It will run good not perfectly jetted and still keep you at a safe level. Here are some good rules of thumb when jetting for different conditions. Very informative post. Just glad to read this blog. Well you have provided some good points but people may differ from this.